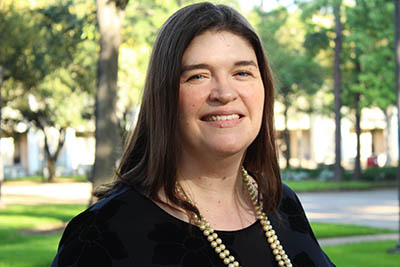 For her “extraordinary commitment” to improving the lives of people with deafblindness, McCormick was honored with the 2019 Texas DeafBlind Symposium Ann Silverrain Award. She also has received the Administrator of the Year Award from the Texas Association of Parents and Educators of the Deaf. McCormick is set to graduate in May with an Ed.D. in professional leadership – special populations, completing the program in two-and-a-half years while working full time. She praised the hybrid online and face-to-face format. “This allowed me to complete a dream the way it was set up,” she said. Despite her packed schedule, the mother of two young children, ages 5 and 3, takes time to present at conferences, including the Statewide Conference for the Education of the Deaf and the Texas Symposium on DeafBlindness.